Mix ginger root, apple, raisins, mango pineapple and lime juice in a mixing bowl. Combine molasses and vinegar in a large saucepan, bring to a simmer; stir in fruit mixture and cayenne pepper. Simmer 8 minutes then remove from heat. Combine all marinade ingredients in blender; process 2 minutes or until smooth. 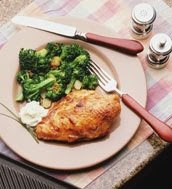 Place chicken breast in shallow baking dish, spoon marinade mixture evenly among the breast; cover and refrigerate 1 hour. Combine all chutney ingredients in small bowl, mix well and set aside. When grill is properly heated to a medium heat, lightly oil grill rack, cook chicken breast 5 minutes and turn each breast, spoon on remaining marinade and cook another 5 minutes until internal temperature is 1650. Remove the chicken from the grill and serve with the Banana Chutney.